Suppose a government claimed the right to commit crimes, make those crimes state secrets and prosecute anyone who revealed them to the public. Could you call such a government democratic? Could you say its people enjoyed freedom of the press? Yet that is what the U.S. government wants to do to Julian Assange. 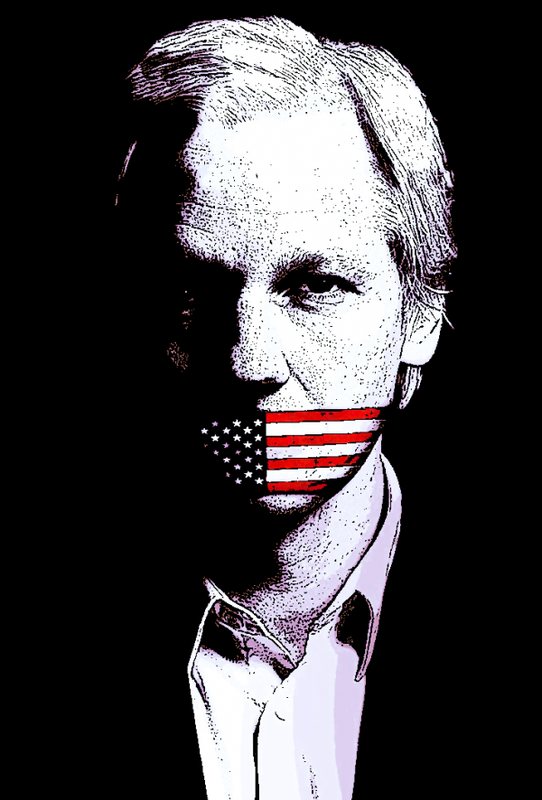 Assange is the founder of Wikileaks, which makes it possible for whistle-blowers to reveal secret documents without their identity being traced. Wikileaks publications revealed, among other things, the secret bibles of Scientology, censored videos of protests in Tibet, secret neo-Nazi passwords, offshore tax scams by Barclay’s bank, the inside story of the crashing of Iceland’s economy and texts of the secret Trans-Pacific Partnership negotiations. What got him into trouble was publication of information of crimes committed by the U.S. government, notably the killing of civilians in Iraq, and secret surveillance of the public by U.S. intelligence agencies. That is why the U.S. government is determined to capture and imprison him. The espionage laws are intended to punish those who give military secrets to a hostile foreign power. In the case of Julian Assange, it is we, the people, who were given the secrets. We are the supposed enemy. A U.S. grand jury investigation of Assange has been ongoing since 2010. It is widely believed that it has made sealed indictments against Assange. He sought political asylum in the Ecuadorian embassy in London in 2012 to avoid extradition to the United States. Since March, the Ecuadorian government has cut him off from communicating with the outside world, except for his lawyers and Australian consular officials. Reportedly the government is planning to expel him from the embassy, leaving him subject to arrest by British police and extradition to the USA. There his likely fate will be imprisonment, probably for life, or execution. What can be done to Assange can be done to anyone who reveals information the U.S. government wants kept secret. Anyone who cares about freedom of the press, or their own freedom, should stand with Julian Assange. Ecuador Will Immediately Withdraw Asylum for Julian Assange and Hand Him Over to the UK. What Comes Next? by Glenn Greenwald for The Intercept. Be Prepared to Shake the Earth If Julian Assange Is Arrested by Caitlin Johnstone. This entry was posted on July 21, 2018 at 2:34 pm and is filed under Abuse of Power, Heroism, Human Rights, Journalism, Law and Justice. You can follow any responses to this entry through the RSS 2.0 feed. You can leave a response, or trackback from your own site. Among the important elements of civilization—to be placed beside democracy and freedom of the press—is the rule of law. That is where the man’s defence could be presented and tested against the facts. There may be good laws and bad laws but these too are subject to democracy and criticism by a free press. Not sure what “strand up” means, a typo surely, but I see no reason to stand up for him. He should accept the consequence of his actions. Nothing short of this will give a chance for the American Government to be seen in its true light, whatever that may turn out to be. In any case it is a government elected within a society where democracy and free speech are proclaimed. Not forgetting the rule of law. Which raises the question, how can an Australian citizen be extradited to the United States? I was looking for somewhere to air the big question I have: Under what theory is Julain Assange subject to US law? As a non-American, not in Amerca, and under no obligation to protect Ameticsn secrets, how can he be luable? Mike Pompeo has opined that Julian Assange has no 1st Amendment rights; now tje US Constitution applies to all American citizens and everybody physically present in the United States. So Mike Pimpeo is acknowledging Assange was neither. While I am a loyal Americann, I do not agree with attempts to extraterritorialize US laws; we are not Masters of the World. I’m not a lawyer, and I accept correction from lawyers, but here is my understanding of the law. U.S. Courts can claim jurisdiction of (1) an American was the victim of a crime, (2) an American was the alleged perpetrator of the crime or (3) the crime happened on American soil. As a possible example of the first, take an Internet con artist claiming, for example, to be a Nigerian prince who swindles some elderly American out of her life savings. An American prosecutor could secure a Grand Jury indictment of such a person, and ask the Nigerian government to extradite him. It would be up to a Nigerian court to decide whether this was an extraditable offense or not. My view of the Julian Assange case is that it is not a criminal justice issue. It is a freedom of the press issue. I object to the U.S. government using the Espionage Act as a means of exercising censorship. The reason for his indictment is that he has published information of public interest that the U.S. government wants to keep secret. It turns out, though, that the actual charge is being an accessory to unauthorized use of a computer, or something like that. This means that his lawyer cannot claim that the Espionage Act is being abused. My defense of Julian Assange is on moral grounds. He is suffering for publishing information about abuse of power. I don’t know how strong a case he has on legal grounds.